Pig. 326.—The square knot is a very uceful knot and should not be confuted with the granny knot. 327.—The granny knot slips under load and should usually be avoided. 391. 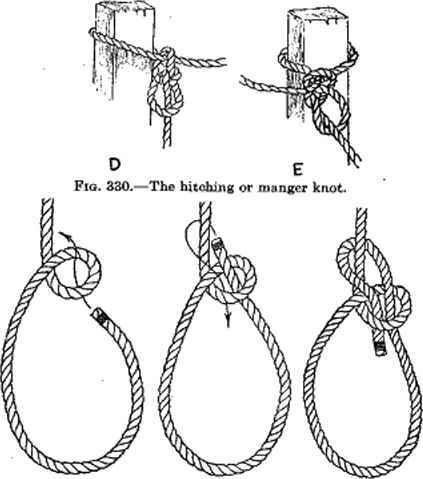 The hitching or manger knot (Fig. 330) is started like a slip knot. 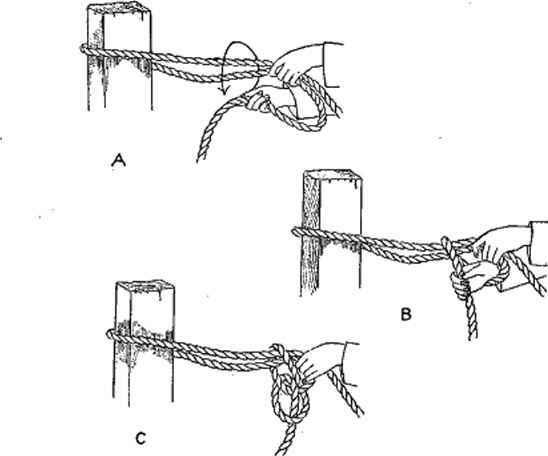 Instead of drawing the rope entirely through and completing the slip knot, however, a bight is left, and the end of the rope passed through this bight. 392. The bowline knot (Fig. 331) is one of the most useful of knots. It holds securely and will not slip nor draw up tight. It is made by forming a loop near the end of the rope and then passing the end through the loop, around the standing part, and back through the loop again. 393. The anchor bend (Fig. 332) is particularly good for fastening a rope into a ring or clevis or around a beam. It is secure, does not draw tight like many other knots, and does not wear the rope excessively. 394. The miller's knot (Fig. 333) is by far the best knot for tying grain sacks. 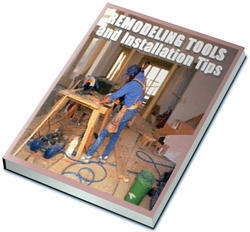 It Is easily tightened by pulling on the ends of the completed knot, holds securely, and is easily untied. The end of the bag is gathered and held tight between the thumb and first finger of the right hand. The tie string is placed across the front of the bag, under the last three fingers, but over the first finger of the right hand. The string is then taken around the neck of the sack, under the heel of the right hand and under all fingers, but over the end of the string. The string is then wound around the neck of the sack a second time in the same manner. 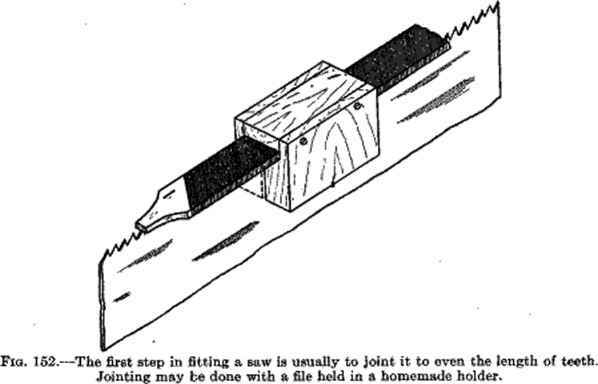 The first finger of the right hand then pulls the end of the tie up under the loop which was formed over the finger when the knot was started. The knot is completed by drawing the ends tight.